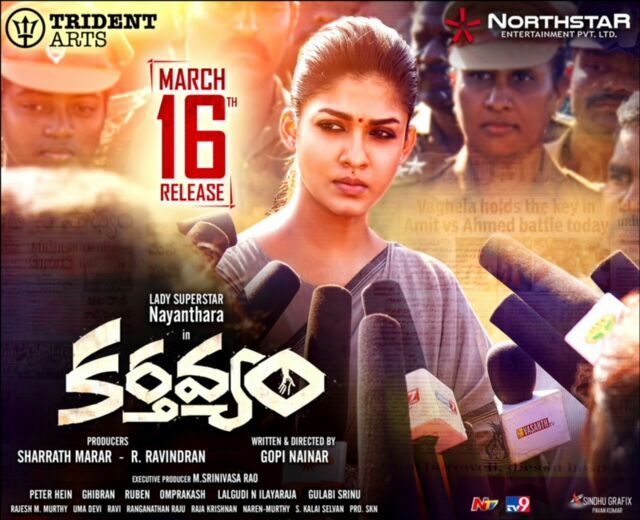 Lady superstar Nayanthara’s latest outing Karthavyam which is dubbed version of Tamil critically acclaimed and commercially successful movie Aramm has received optimistic report from critics as well as audience. Karthavyam is all about a district collector Madhu Varshini played by Nayanthara. It deals with a bg present-day problem, that of deep, unused bore-wells, which are bone-dry and left uncovered by callous contractors. The openings of these wells are at ground level, and that is what makes them so dangerous. Coming to the story, a four years old girl falls into a bore-well about 90 feet deep. Rescue team goes there to save the girl. Nayanthara rushes to the spot to be provoked by what looks like insoluble problems such as a broken-down fire engine blocking the only narrow road to the village, frenetic parents of the girl, angry villagers baying for the blood of the guilty, ruthless politicians and an insensitive media. Although it is first film for director Gopi Nainar, he has aptly depicted situations in an isolated area where people go miles for drinking water. Actually story turns gripping and emotional after the girl is trapped in bore-well. TV chat episodes were shot again for Telugu audience and they discussed valid points like how governments neglect poor people and how they disregard real hidden talent in youth. Real drama starts in second half where Nayanthara takes bold decisions to rescue the baby. There are many episodes which make you emotive and bring tears in your eyes. Gopi Nainar is well supported by his artists and technicians. Cinematography and music played crucial in the narrative. While Nayanthara pulled off the role of an IAS officer efficiently, other artists gave their best. There is no language barrier for films of these kinds. One should not miss this film which is high on emotions. As per reports from various corners, Karthavyam is receiving positive response from audience from all the centers.